The .NET TraceListners monitor trace and debug output. You use TraceListners to redirect this output to a specific medium. There are 3 TraceListners available: DefaultTraceListener, EventLogTraceListener and TextWriterTraceListener. The NotificationFormTraceListener is a special TraceListner which allows you to monitor the output in a special TraceForm which can be activated using a Notification icon. The NotificationFormTraceListener can be used in a Windows application. You have to create one and add it to the (static) Listeners collection of the System.Diagnostics.Trace class. Don't forget to Dispose the listener when you exit the application. This is necessary because an extra Thread is used for the NotificationFormTraceListener. This Thread doesn't stop automatically. The ContextMenu of the NotificationIcon makes it possible to Open the TraceForm, set the 'Always on Top' option and Exit. You can add TraceListeners from your code but you can also add them by editing the configuration file that corresponds to the name of your application. Within this file, you can add a listener, set its type and set its parameter, remove a listener, or clear all the listeners previously set by the application. TraceListers can help you to debug your code. The NotificationFormTraceListener helps you to monitor the Trace and Debug output in more convenient way. Damien Pitman who reported and solved a threading problem (bug). 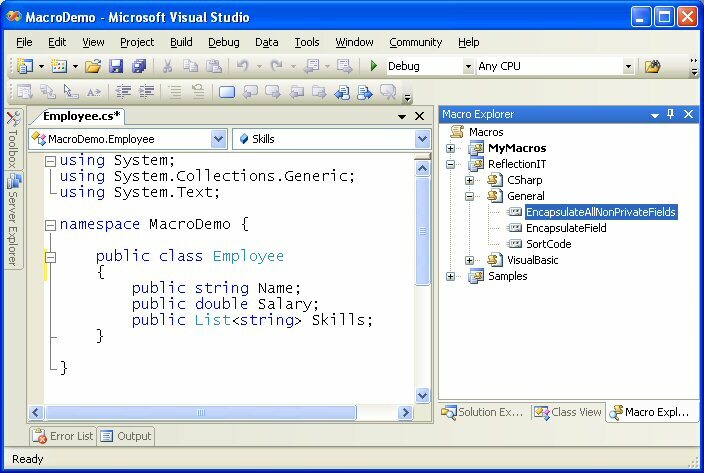 I have created a new Visual Studio 2005 Macro which can be used to convert a literal text to an asp:Label that is associated to the next control. You first have to select the text and then Run the ConvertSelectedTextToAssociatedLabel Macro. In the example below the text Age: is selected. 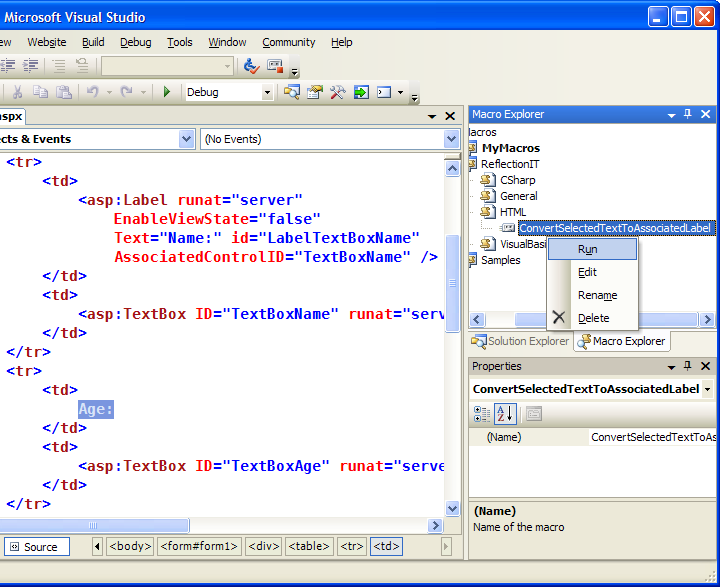 The result is an asp:Label with the correct Text and AssociatedControlID attributes. I finally found some time to play with XNA. I learned a lot from Rob Miles at TechEd 2006. He has some great samples on his website. Rob will also be presenting about this subject on the DevDays 2007 in the Netherlands. Fun is guaranteed. My first game is a remake of a game I build 20 years ago on my Commodore 64. You must move around a bouncing ball using your joystick. The ball may not collide with the flying birds. It took me only a few hours to build and it was great fun.